On the heels of the historic June 12 Trump-Kim Singapore Summit that de-escalated tensions between North Korea and the US, Secretary of State Mike Pompeo made his third visit to NK to move the negotiations for denuclearization and security on the peninsula forward. He met with his North Korean counterpart, Vice Chair of the Party Central Committee, Kim Young Chol, on July 6 and 7, for intensive negotiations. At the end of the meeting, on leaving Pyongyang, Secretary Pompeo declared that the summit had been conducted in good faith and that he had “made progress on almost all central matters”. Without divulging details, he stated there was more work to be done, which would be continued by working groups on both sides and that a follow up meeting had been scheduled. The North Korean Foreign Ministry released a more sobering assessment, stating that despite high expectations after the summit they found “regrettable” the US failure to approach the negotiations in a balanced and constructive manner, and critiquing the “opposing winds” that recapitulate the “tired old process” (CVID, disclosure, verification first) that could lead to failure, and that have ignored or misinterpreted their unilateral gestures of good will, forbearance, and their desire for phased, mutual, step-wise measures based on the creation of “objective conditions for trust”. 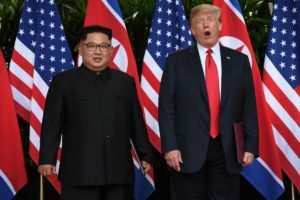 Clearly, after the euphoria of the Singapore summit, this is a drilling down onto the details on process, timing, specifics, and reciprocity necessary for the successful implementation of the Singapore Summit’s four enumerated commitments: normalization, peace, denuclearization, and repatriation of remains. Clearly there is much to bridge in terms of procedure, protocol, sequencing, as well as a need to overcome mutual distrust and historical antagonism. The North Korean statement is a quiet but firm dressing down of the Bolton Approach that seems to have been upfront in the recent negotiation, that seeks to rapidly frontload the process with North Korean concessions on disarmament, after which US concessions and security guarantees could be provided. The North points to this “tired old approach” as lacking simultaneity, mutuality, and trust-building measures, and points out it has clearly failed in the past. They peg it—in polite diplomatic language—as the definitionally insane practice of doing the same thing over and over again while expecting different outcomes. They take great pains to point out that Trump’s approach was the promise of a bold, new approach to denuclearization, mutually agreed-upon at the summit, and they hint that “working level groups”, and “oppositional winds” might be working in a way that contravenes what they understand to have been proposed and agreed to by Trump. There is, in the statement, a question to Washington as to whether its charges are faithfully implementing its own stated desires and will, as well as an inquiry as to whether there is congruence and internal alignment (or change of tactics) within the administration. It is also a not-so-subtle hint that if the Bolton faction is ascendant, then the bets are likely to be called off. It’s important to note here that the North Korean Foreign Ministry statement, while clearly critical and inquiring, is very measured, relative to past statements from the leadership, and there is little overblown rhetoric there. If anything, the language is careful and circuitous, and the recrimination is largely self-directed: they may have been “naïve to the point of foolishness in their hopes and expectations”, and they express their worries of “great disappointment and tragedy”. They critique the “erroneous thinking” that assumes that “our forbearance” will accommodate the “demands based on such a strong-arming mindset” and consider “unhelpful” the “hurriedness that has seized” the US that elides the need for confidence-building measures to overcome “deep-rooted mistrust”. Nevertheless, they mention that they still “faithfully maintain their trust” in Trump and make clear their intentions to continue to denuclearize. They finish with an almost wistful tone: they warn of deep disappointment to the international society and global peace and security, and that there is no guarantee that a tragic outcome will not follow from this one-sided approach. By attributing “Gangster-like” invective to North Korea, the Times refreshes the “irrational, out-of-control, over- the- top, can’t-be-negotiated-with” framing that has prevented, sabotaged and derailed negotiation in the past. It also puts the Trump administration further on the back foot, reprising the illogical trope that the US had demeaned its global standing just by meeting with North Korea, and is now further demeaned by tolerating being insulted by it. Although early media outlets were circumspect in their characterization of the disagreement, focusing appropriately on the disappointment and regret by North Korea in the divergence in the talks from agreed upon approaches in Singapore, after the NY Times published this incendiary headline, the “gangster” trope was then picked up by the BBC, CNN, Bloomberg, even DemocracyNow! and is now the standard media sound bite about the meeting. The administration is now in the awkward position of defending against the NY Times epithet rather than discussing its work for peace and denuclearization. The phrase the NY Times is referring to in the statement is “강도적인 비핵화요구” . In literal translation, this would be “robber-like”, but in this context would be more accurately translated as “strong arming, or high pressure demands for denuclearization.”1 The North has no problem using strong language in its statements, but this statement hardly conforms to that type. As noted above, it’s a pointed critique of the “cancerous” Bolton approach—tempered with self-criticism and an appeal to faithfully implement the new approaches and attitudes of the Singapore summit. It’s hardly the incendiary firebomb the NY Times would like it to be. But, if the US, sized by a sense of impatience, tries to enforce on us, the old ways asserted by previous administrations, this will not give us any help in solving the problem. If the objective conditions conducive to denuclearization in accordance with our wills are not established, then it’s possible that the currents of positive development in developing bilateral relations in the beginning could become confused [turbulent]. Should opposing winds start to blow, this could bring great disappointment to international society that desires peace and security, as well as to the US and NK; and if that happens, then both sides would start to explore other options; there is no guarantee that this would not lead to tragic consequences. [However] We still faithfully maintain our trust in President Trump. The US should reflect seriously whether, in opposition to the will of its [own] leaders, permitting these opposing forces (“winds”) meets the aspirations and expectations of the people of the world, and whether it meets the interests of its own county. Dispelling deep-rooted mistrust, and building trust between the DPRK and the U.S.; seeking to resolve the problem in completely new way—by boldly breaking away from past methods and being unconstrained by conventional methods that have only resulted in failure; prioritizing trust-building while solving one-by-one problems that can be solved through a step-by-step process, [based on the] principle of simultaneous [reciprocal] actions: this is the fastest shortcut to denuclearization. Perhaps the storied NY Times has no one on their large staff capable of rendering a nuanced, contextual interpretation of North Korean statements—even for the most delicate of delicate negotiations. Perhaps this is part of their baked-in, irredeemable, click-baiting journalistic incompetence. But taken in context with a past record of journalistic gangsterism—namely criminally irresponsible lies and misrepresentation agitating for violent war of aggression—it’s understandable it might jump to see gangsters and gangsterism everywhere. 력사적인 첫 조미수뇌상봉과 회담이 진행된 이후 국제사회의 기대와 관심은 조미수뇌회담 공동성명의 리행을 위한 조미고위급회담에 쏠리였다. After the first historic summit meeting was held between the DPRK and the U.S., international society has focused its expectation and attention on the high-level DPRK-U.S. talks for the implementation of the Joint Statement of the DPRK-U.S. summit. 우리는 미국측이 조미수뇌상봉과 회담의 정신에 맞게 신뢰조성에 도움이 되는 건설적인 방안을 가지고 오리라고 기대하면서 그에 상응한 그 무엇인가를 해줄 생각도 하고있었다. We expected that the U.S. side would bring [to the talks] constructive proposals that would help trust-building in accordance with the spirit of the DPRK-U.S. summit meeting. We, on our part, were also thinking of offering things to match this. 그러나 6일과 7일에 진행된 첫 조미고위급회담에서 나타난 미국측의 태도와 립장은 실로 유감스럽기 그지없는것이였다. However, the the attitude and position that appeared in the US Side during the first high level talks held on July 6th and 7th was truly regretful. Our side, during the talks, put forward constructive proposals in order to seek a balanced implementation of the Joint Statement, out of our firm willingness faithfully implement of the spirit and the agreed-upon provisions of the DPRK-U.S. summit meeting and talks. 조미관계개선을 위한 다방면적인 교류를 실현할데 대한 문제와 조선반도에서의 평화체제구축을 위하여 우선 조선정전협정체결 65돐을 계기로 종전선언을 발표할데 대한 문제,비핵화조치의 일환으로 ICBM의 생산중단을 물리적으로 확증하기 위하여 대출력발동기시험장을 페기하는 문제,미군유골발굴을 위한 실무협상을 조속히 시작할데 대한 문제 등 광범위한 행동조치들을 각기 동시적으로 취하는 문제를 토의할것을 제기하였다. These included proposing wide-ranging, simultaneous, mutual, proactive steps, such as realizing multilateral exchanges for improved relations between the DPRK and the U.S; making a public declaration to the end of war on the occasion of the 65th anniversary of the signing of the Korean Armistice Agreement, in order to build a peace regime on the Korean Peninsula; as a single element of the denuclearization process, dismantling [our] high thrust jet engine test grounds as concrete proof of the suspension of ICBM production; and making the earliest start on working-level talks for repatriating POW/MIA remains. 회담에 앞서 조선민주주의인민공화국 국무위원회 위원장 김정은동지께서 트럼프대통령에게 보내시는 친서를 위임에 따라 우리측 수석대표인 김영철 당중앙위원회 부위원장이 미국측 수석대표인 폼페오국무장관에게 정중히 전달하였다. Prior to the talks, Kim Yong Chol, vice-chairman of the Central Committee of the Workers’ Party of Korea, our chief delegate from our side to the talks, was tasked to convey, with due respect, to U.S. Secretary of State Pompeo, a personal letter from the Chairman of the State Affairs Commission of the DPRK, Kim Jong Un to President Trump. 국무위원회 위원장동지께서는 싱가포르수뇌상봉과 회담을 통하여 트럼프대통령과 맺은 훌륭한 친분관계와 대통령에 대한 신뢰의 감정이 이번 고위급회담을 비롯한 앞으로의 대화과정을 통하여 더욱 공고화되리라는 기대와 확신을 표명하시였다. Chairman Kim Jong Un expressed his hope and conviction that the excellent personal relations and his feelings of trust forged with President Trump at the Singapore summit would be further consolidated through the process of this and other future dialogues. 그러나 미국측은 싱가포르수뇌상봉과 회담의 정신에 배치되게 CVID요,신고요,검증이요 하면서 일방적이고 강도적인 비핵화요구만을 들고나왔다. But, contrary to the spirit of the [agreed upon provisions of] the Singapore summit, the U.S. side came out only with unilateral and strong-arm demands for denuclearization, that is, calling only for CVID, declaration and verification. 정세악화와 전쟁을 방지하기 위한 기본문제인 조선반도평화체제구축문제에 대하여서는 일절 언급하지 않고 이미 합의된 종전선언문제까지 이러저러한 조건과 구실을 대면서 멀리 뒤로 미루어놓으려는 립장을 취하였다. The U.S. side never mentioned the issue of establishing a peace regime on the Korean peninsula which is essential for preventing the deterioration of the situation and preventing war. It took the position that it could delay the agreed-upon statement to end the war with sundry conditions and excuses. 종전선언을 하루빨리 발표할데 대한 문제로 말하면 조선반도에서 긴장을 완화하고 공고한 평화보장체제를 구축하기 위한 첫 공정인 동시에 조미사이의 신뢰조성을 위한 선차적인 요소이며 근 70년간 지속되여온 조선반도의 전쟁상태를 종결짓는 력사적과제로서 북남사이의 판문점선언에도 명시된 문제이고 조미수뇌회담에서도 트럼프대통령이 더 열의를 보이였던 문제이다. The issue of announcing the declaration of the end of war at the earliest possible date, is the [key] priority process [necessary] to defuse tension and establish a lasting peace regime on the Korean peninsula. It is the priority factor in building trust between the DPRK and the U.S. This issue was also stipulated in Panmunjom Declaration as the historical task to terminate the nearly 70-year-old condition of war on the Korean peninsula. President Trump, too, was more enthusiastic about this issue at the DPRK-U.S. summit talks. 미국측이 회담에서 끝까지 고집한 문제들은 과거 이전 행정부들이 고집하다가 대화과정을 다 말아먹고 불신과 전쟁위험만을 증폭시킨 암적존재이다. The issues the U.S. side insisted on till the very end at the talks are a cancerous [i.e. destructive] entity [position], which previous administrations also had stubbornly insisted on, that sabotaged the dialogue process, and increased distrust and the danger of war. 미국측은 이번 회담에서 합동군사연습을 한두개 일시적으로 취소한것을 큰 양보처럼 광고했지만 총 한자루 페기하지 않고 모든 병력을 종전의 자기 위치에 그대로 두고있는 상태에서 연습이라는 한개 동작만을 일시적으로 중지한것은 언제이건 임의의 순간에 다시 재개될수 있는 극히 가역적인 조치로서 우리가 취한 핵시험장의 불가역적인 폭파페기조치에 비하면 대비조차 할수 없는 문제이다. The U.S. side, during the talks, made a great publicity about suspension of one or two joint military exercises as a tremendous concession. But the temporary suspension of single exercise-type action is a highly reversible step which can be resumed immediately at any moment as all of its military force remains in its previously positioning, with not a single rifle removed. This is incomparable with the irreversible steps taken by us to explode and dismantle our nuclear testing site. 회담결과는 극히 우려스러운것이라고 하지 않을수 없다. We cannot but be extremely worried about the outcomes of the talks. 미국측이 조미수뇌상봉과 회담의 정신에 부합되게 건설적인 방안을 가지고 오리라고 생각했던 우리의 기대와 희망은 어리석다고 말할 정도로 순진한것이였다. One could say we were naïve to the point of foolishness in our expectation and hope that the US would come forth with a constructive proposals in accordance with the spirit of the US-NK summit meeting. 낡은 방식으로는 절대로 새것을 창조할수 없으며 백전백패한 케케묵은 낡은 방식을 답습하면 또 실패밖에 차례질것이 없다. Tired, old methods can never create new outcomes. Only failure comes from following proven-to-fail, worn out methods. 조미관계력사상 처음으로 되는 싱가포르수뇌회담에서 짧은 시간에 귀중한 합의가 이룩된것도 바로 트럼프대통령자신이 조미관계와 조선반도비핵화문제를 새로운 방식으로 풀어나가자고 하였기때문이다. Because President Trump himself proposed that US-NK relations and denuclearization of the peninsula be resolved in a new fashion, for the first time in US-NK relations, a valuable agreement was reached in a very short time. 쌍방이 수뇌급에서 합의한 새로운 방식을 실무적인 전문가급에서 줴버리고 낡은 방식에로 되돌아간다면 두 나라 인민의 리익과 세계의 평화와 안전을 위한 새로운 미래를 열어나가려는 수뇌분들의 결단과 의지에 의하여 마련되였던 세기적인 싱가포르수뇌상봉은 무의미해지게 될것이다. The historic Singapore summit—achieved by the determination and the will of its top leaders to open a new future for the peace and benefit of the whole world—will become pointless, if working-level groups renege on the mutually agreed new approach agreed at the summit, and return to the old methods. 이번 첫 조미고위급회담을 통하여 조미사이의 신뢰는 더 공고화되기는커녕 오히려 확고부동했던 우리의 비핵화의지가 흔들릴수 있는 위험한 국면에 직면하게 되였다. These first DPRK-U.S. high-level talks, rather than consolidating trust, have brought us face-to-face with a dangerous situation where our unshakable will for denuclearization might waiver. 우리는 지난 몇달동안 할수 있는 선의의 조치들을 먼저 취하면서 최대의 인내심을 가지고 미국을 주시하여왔다. In the past few months, we exercised maximum forbearance and observed the U.S. while initiating as many goodwill measures as we could. 그러나 미국은 우리의 선의와 인내심을 잘못 리해한것 같다. But, it seems that the U.S. misunderstood our goodwill and forbearance. 미국은 저들의 강도적심리가 반영된 요구조건들까지도 우리가 인내심으로부터 받아들이리라고 여길 정도로 근본적으로 잘못된 생각을 하고있다. The U.S. is fundamentally mistaken in its reasoning if it goes so far as to conclude that its demands—reflecting its strong-arm mindset—would be accepted by us out of our forbearance. 조미사이의 뿌리깊은 불신을 해소하고 신뢰를 조성하며 이를 위해 실패만을 기록한 과거의 방식에서 대담하게 벗어나 기성에 구애되지 않는 전혀 새로운 방식으로 풀어나가는것,신뢰조성을 앞세우면서 단계적으로 동시행동원칙에서 풀수 있는 문제부터 하나씩 풀어나가는것이 조선반도비핵화실현의 가장 빠른 지름길이다. Dispelling deep-rooted mistrust, and building trust between the DPRK and the U.S. seeking to resolve the problem in completely new way—by boldly breaking away from past methods and being unconstrained by conventional methods that have only resulted in failure; prioritizing trust-building while solving one-by-one problems that can be solved through a step-by-step process, [based on the] principle of simultaneous [reciprocal] actions: this is the fastest fastest shortcut to denuclearization. 그러나 미국측이 조바심에 사로잡혀 이전 행정부들이 들고나왔던 낡은 방식을 우리에게 강요하려 한다면 문제해결에 아무런 도움도 주지 못할것이다. But, if the US, sized by a sense of urgency [impatience], tries to enforce on us, the old ways asserted by previous administrations, this will not give us any help in solving the problem. 우리의 의지와는 별개로 비핵화실현에 부합되는 객관적환경이 조성되지 못한다면 오히려 좋게 시작된 쌍무관계발전의 기류가 혼탕될수 있다. 역풍이 불기 시작하면 조미량국에는 물론 세계평화와 안전을 바라는 국제사회에도 커다란 실망을 안겨줄수 있으며 그렇게 되면 서로가 필경 다른 선택을 모색하게 되고 그것이 비극적인 결과에로 이어지지 않으리라는 담보는 어디에도 없다. Should opposing winds start to blow, this could bring great disappointment to an international society that desires peace and security, as well as to the US and NK; and if that happens, then both sides would start to explore other options; there is no guarantee that this would not lead to tragic consequences. 우리는 트럼프대통령에 대한 신뢰심을 아직 그대로 간직하고있다. We still faithfully maintain our trust in President Trump. 미국은 수뇌분들의 의지와는 달리 역풍을 허용하는것이 과연 세계인민들의 지향과 기대에 부합되고 자국의 리익에도 부합되는것인가를 심중히 따져보아야 할것이다. The U.S. should reflect seriously whether, in opposition to the will of its [own] leaders, permitting these opposing forces (“winds”) meets the aspirations and expectations of the people of the world, and whether it meets the interests of its own country. This article was posted on Tuesday, July 10th, 2018 at 11:36am and is filed under Donald Trump, Imperialism, Korea, Language, Narrative, North Korea, President Kim Jong-un.